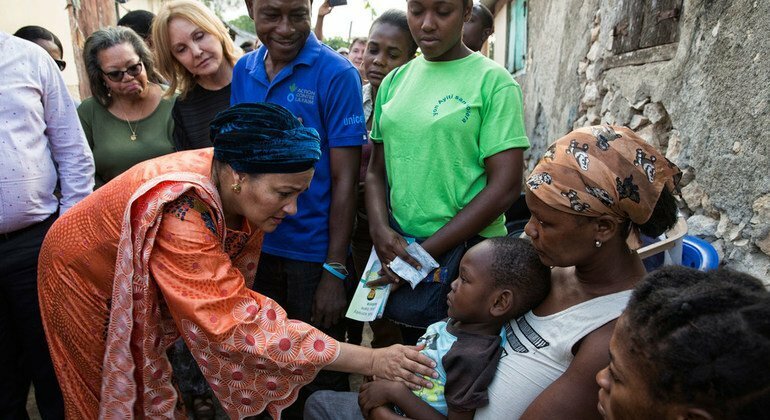 The UN maintains its commitment to working with the national authorities for the elimination of the disease in the country and … the Secretary-General considers cholera in Haiti a top priority. On 19 August 2016, the Secretary-General announced the United Nations’ new approach to cholera in Haiti. 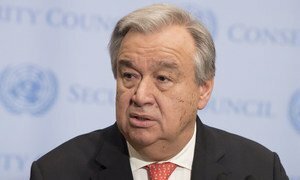 The Secretary-General indicated that he deeply regrets the terrible suffering the people of Haiti have endured as a result of the cholera epidemic and that the United Nations has a moral responsibility to the victims of the cholera epidemic and to support Haiti in overcoming the epidemic and building sound water, sanitation and health systems. He stressed that eliminating cholera from Haiti will take the full commitment of the Haitian Government and the international community and, crucially, the resources to fulfil this shared duty. Josette Sheeran, UN Special Envoy for Haiti, visits Mirbalais’ Hôpital Universitaire during a three-day visit to Haiti to address the Cholera situation (November 2017). On 20 June 2017, Secretary-General António Guterres appointed Josette Sheeran of the United States as his Special Envoy for Haiti. 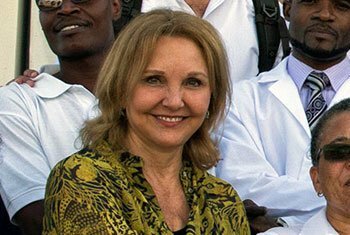 As Special Envoy, Ms. Sheeran will guide full implementation of the United Nations new approach to reduce the impact of cholera in Haiti and support national efforts to implement Haiti’s 2030 sustainable growth and implementation plan. The new approach on cholera involves two tracks; the first to intensify efforts to reduce and ultimately end the transmission of cholera, improve access to care and treatment and address the longer-term issues of water, sanitation and health systems in Haiti. Track two involves developing a package of material assistance and support for those Haitians most directly affected by cholera. Ms. Sheeran's humanitarian work with Haiti includes serving as United States Under Secretary of State in 2006, visiting Haiti to promote economic growth and to assess United Nations effectiveness in her role as a member of the United Nations high-level panel on humanitarian and development assistance reform; in 2008 to assess the impact on the victims of the mudslides in the city of Gonaives; in 2010, as Head of the United Nations World Food Programme (WFP), to work with the Haitian Department of Civil Protection on hurricane preparedness, and in January 2010, to the earthquake zone to help guide WFP’s $279 million relief operation to reach 2 million Haitians with life-saving food; and in May 2010 to assess WFP’s food and cash for work programmes. 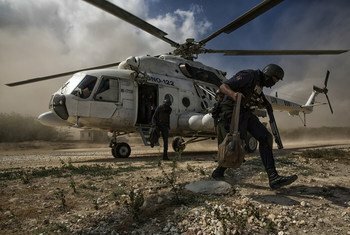 The mandate of the United Nations Mission for Justice Support in Haiti (MINUJUSTH) is set out in the Security Council Resolution 2350 (2017), which was adopted on 13 April 2017. 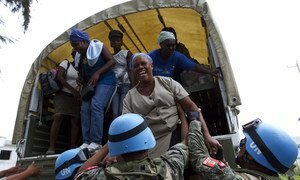 MINUJUSTH began operations upon the completion of the mandate of the United Nations Stabilization Mission in Haiti (MINUSTAH). MINUJUSTH assists the Government of Haiti to further develop the Haitian National Police (HNP); to strengthen Haiti’s rule of law institutions, including the justice and prisons; and to promote and protect human rights – all with a view to improving the everyday lives of the Haitian people.